A special Thank You to Mira Books and NetGalley for sending me this book to review. This year, Becca Timm knows the number one item on her Christmas wish list—getting over Denny Cutler. Three years ago, Denny broke her heart before heading off to war. It's time she got over her silly high-school relationship and moved on. So she takes matters into her own hands and heads up to Virgin River, the rugged little mountain town that Denny calls home, as an uninvited guest on her brother's men-only hunting weekend. But when an accident turns her impromptu visit into an extended stay, Becca finds herself stranded in Virgin River. With Denny. In very close quarters. As the power of Christmas envelops the little town, Becca discovers that the boy she once loved has become a strong and confident man. And the most delicious Christmas present she can imagine. Usually romance novels aren't this good. This was brilliant! It actually had a plot! The character's were loveable, and I even shed a tear for all the Christmas spirit at the end. 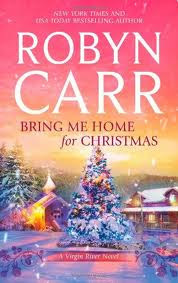 What a great book to get me in the Christmas mood! Becca shows up on her brother's doorstep at 3am, bags packed, ready to go on a guys hunter trip. She says she just needs to get away, but she really wants to see if Denny, her ex-boyfriend, and her can finally have some closure to their breakup a few yrs ago. I smell trouble! And romance! It is kind of funny the situations that Becca gets herself in, and ultimately end up her saving grace. We actually got to know the character's well, and I wouldn't mind living in such a town. If they exist! It was like a dream. This book was full of Christmas spirit and love. I'm totally in the mood now and can't stop listening to Christmas music and watching Christmas movies. I actually wanted more of the story. I know you'll enjoy this. I did!